Camp O’Donnell – Six survivors of the Bataan Death March during World War II had a glance of the “boxcar” that transported them to the San Fernando terminal 70 years ago during their visit to this former Japanese concentration camp, where the prisoners of war were held. “After 70 years I’m back and I’m proud,” said Warren Jorgensen, 91, of the 4th Marine Regiment, who was among the defenders of Corregidor at the height of the Japanese invasion. 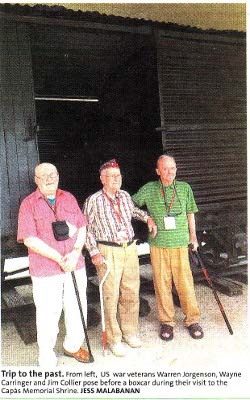 Jorgensen and five other Philippine war veterans – Wayne Carringer, 91, of North Carolina, and member of the 27th Bomb Group of the US Army Air Corps; Jim Collier, 88, of the US Army’s 59th Coast Artillery; Bob Ehrhart, of the 4th Marine Regiment; Ed Night, of the US Army’s 43rd Infantry; and Lawrence Nelson, of the US Army’s 1st Cavalry – relived the past while touring the Capas National Shrine on Saturday. The veterans were accompanied by students from the College of the Ozarks during their 10-day tour of the various significant sites – including Camp O’Donnell in Balanga City, and Mount Samat in Pilar, Bataan – to celebrate the 70th anniversary of “Araw ng Kagitingan” or Day of Valor. “I feel good,” Collier said as he agreed to a photo shoot by the Manila Standard. 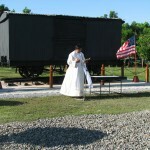 The 240-square-foot boxcar, a World War II relic, is on display in Camp O’Donnell. It is one of the last known surviving freight cars of its kind and one of the major tourist attractions of the national shrine. “It was the mute witness to the human sacrifice and heroism of all the victims of the death march,” the marker says. 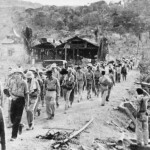 Carringer experienced the Death March after his capture by the Japanese soldiers. From Mariveles in Bataan to kilometer 102 at the old train terminal in San Fernando, the prisoners endured severe heat, hunger, and thirst. 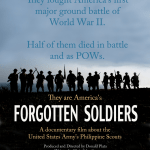 “We were burying a lot of our fellows there a day, and most of us were too weak,” he said.